Would you love to see the return of Spaceballs? Spaceballs has to be, without a doubt, the all-time greatest sci-fi spoof film ever created and now Mel Brooks is talking about a sequel. Even in the original Spaceballs, Mel Brooks' character, Yogurt, stated that all the characters would be back in Spaceballs 2: The Search for More Money. Unfortunately, not all of the original cast can return for the sequel. It’s been 28 years since the original Spaceballs film was released and in that time the world has lost two of the main cast members: John Candy, who played Barf and Joan Rivers, who was the voice of Dot Matrix. Would you be up for watching Spaceballs 2? Can it work 28 years later and missing vital cast members? Spaceballs was, and still is, one of my favourite movies. I would be all over a sequel. 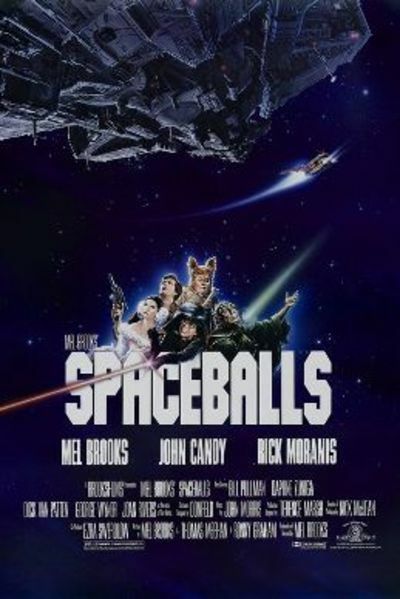 The spoof genre of films has really been lackluster over the past couple of decades, so a second Spaceballs by a master of the genre like Brooks, would be awesome! I never saw this fim, so I won't bother going to see the second. I'm not sure, I love Spaceballs and I love Mel Brooks (though I might put Galaxy Quest as my favourite sci-fi spoof!) but would I want a sequel after 28 years? Probably not. Unless it was connected but not a direct sequel, so then the missing cast wouldn't be so much of a problem. I think Galaxy Quest is the only spoof made after 1995 that I really enjoyed. It was such a fun movie! And even though I'm not a big fan of Tim Allen's acting, he was great in Galaxy Quest. Tim Allen is good but Alan Rickman really makes the film for me :) And I'm not normally a fan of his! No thanks, I'll pass on that one. Nope. I found the original funny when I first saw it because I was about nine years old. Having seen part of it again more recently it's a bit juvenile for my taste. Though that one scene with the chestburster alien did crack me up, I don't know why. If they make a sequel I won't go to see it but I suppose I'd watch it if it eventually comes on tv late at night. What movies are you most excited about seeing in theatres this season? Are you excited for The Hobbit: The Battle of Five Armies? Which movie had the worst ending? What is your favourite sci-fi movie? What’s the most anticipated movie of 2015 in your home? Do have a favourite movie from 2018? What video game franchise would like to see adapted to film? Who is your Favourite Voice-Actor in Film? Do you like Sports Movies, even if you don't follow the sport? What did you think of Edge of Tomorrow? Are you eagerly awaiting Hellboy 3? Do you still go to the theatre to see movies? Are you excited about Jurassic World hitting theatres next year? What was your favourite comedy movie growing up? Would Rob Pattinson make a good Indiana Jones or Han Solo?